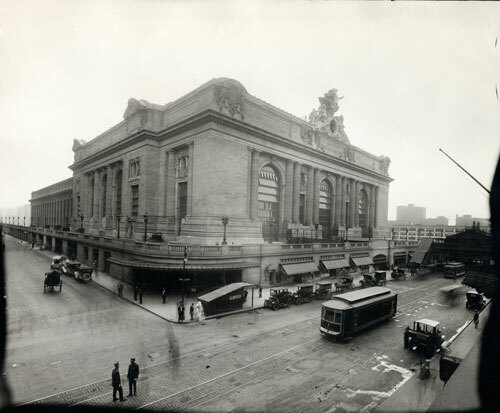 At one minute after midnight on February 2,1913, the first train to leave the new Grand Central Terminal pulled out of the station. That day over 150,000 visitors crowded into the station to inspect the new building, opened to the public after ten years of construction. Commuters saw a monumental new station outfitted with modern comforts and amenities, such as hair salons, dressing rooms, and an emergency hospital for ill travelers. In place of the stairs platforms were accessed by ramps, providing easy transport for passengers. The new station was conceptualized by William Wilgus, the chief engineer of the Vanderbilt-owned New York Central Railroad, after a fatal accident occurred on the rail line. In January 1902, two trains collided in a tunnel clouded by the smoke emitted from steam locomotives. The collision led Wilgus to propose a radical restructuring of the railroads and the building of a new terminal. Under his plan, the railroad would become electrified, which would considerably reduce noise and air pollution. The track system would become more efficient and organized, utilizing double-deck underground tracks. New York Central held a national design competition to select the architect for the new terminal. The St. Paul firm Reed & Stem won, likely at least in part because of the relationship between Wilgus and Allen Stem, his brother-in-law. That relationship wasn’t the only nepotistic connection, however. Warren & Wetmore, a New York City firm, was selected to collaborate with Reed & Stem on the design: Whitney Warren was a cousin to the Vanderbilts. Ultimately Reed & Stem managed the engineering of the station, and Warren & Wetmore designed the Beaux Arts aesthetic.